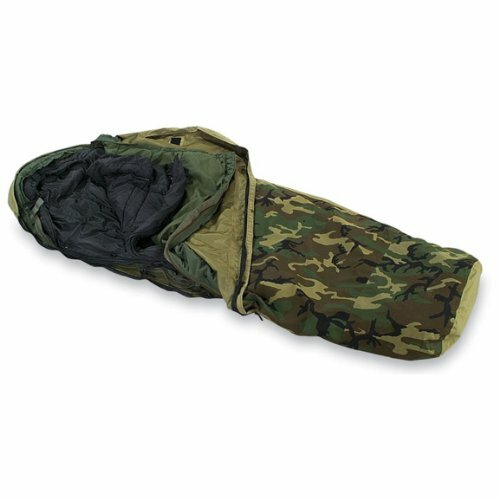 The Military Outdoor Clothing 4-Part Modular Sleep System sleeping bags and other components are constructed to be used in conjunction with each other, or separately to complete an interoperable system. The modular sleep system is designed to provide comfort in temperature ranging from 50 degrees F to -30 degrees F when wearing various layers of extreme cold weather clothing. Patrol Sleeping Bag for temperatures to +30 degrees. Reversible double-pull (opens end to end) slider allows top or bottom ventilation non-locking slide fastener self repairs if jammed or snagged. Draft flap prevents heat loss. Hood adjusts for heat retention; includes nylon draw cord and barrel lock. Measures 92 by 37 Inch. Intermediate Sleeping Bag temperatures to -10 degrees. Free from cold spots. Insulation does not migrate in the bag anatomically designed foot box contains twice the insulation as the bag. Sewn-in, quilted chest collar prevents air drafts up and down through the hood. Measures 87 Inch by 35.5 Inch. Bevy cover made from waterproof, moisture-vapor-permeable material with all seams heat sealed Includes snap fastener and slide fastener. Measures 85 by 28 by 35 Inch. Compress Stuff Sack Constructed of water resistant materials. Compressible to one cubic foot. Six 1-inch-wide nylon webbing straps adjust by ladder lock buckles Reinforcement webbing is sewn around the circumference of the bag. Nylon draw cord closure with a barrel lock. Measures 3 by 14 Inch. Used military surplus.